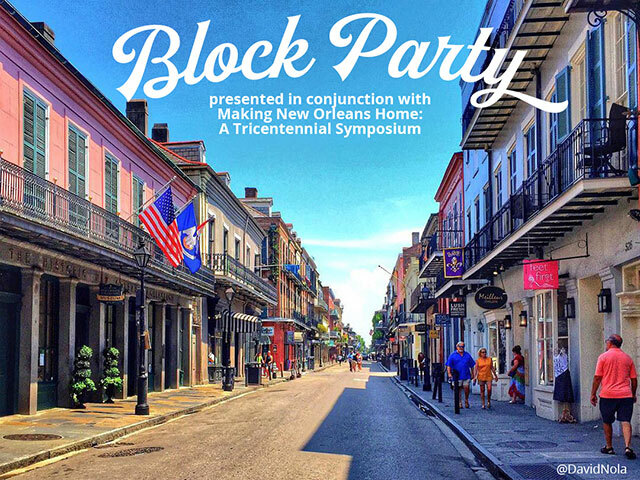 In conjunction with “Making New Orleans Home: A Tricentennial Symposium,” The Historic New Orleans Collection will host a block party complete with live music, a sneak peek of its forthcoming exhibition center at 520 Royal Street, and more on Friday, March 9, from 4:30 to 7 p.m. The event will follow the close of the Friday sessions of the symposium, which take place at the Hotel Monteleone, 214 Royal Street. Leroy Jones’ Original Hurricane Brass Band will welcome attendees and the public to the 500 block of Royal from 4:30 to 5:30 p.m., and the Dukes of Dixieland will perform in THNOC’s courtyard at 533 Royal Street from 5 to 7:30 p.m. Guardians of the Flame Mardi Gras Indians will perform in the street at 5:30 p.m. and 7 p.m. Food and beverages will be available for purchase from local bars and restaurants including Antoine’s Restaurant. THNOC’s current exhibition New Orleans, the Founding Era will be on view until 7:30 p.m., and the courtyard of the Seignouret-Brulatour Building—the site of THNOC’s new facility—will be open for visitors with digital visuals of the renovations to come on view, along with video footage from the museum’s holdings. “Making New Orleans Home: A Tricentennial Symposium” is a four-day event presented by THNOC with the 2018 NOLA Commission, Tulane University, Xavier University, and the Midlo Center for New Orleans Studies at the University of New Orleans. Speakers from around the world, including keynote speaker Cokie Roberts and author Isabel Wilkerson, will explore the 300-year history of how New Orleans came to be inhabited by diverse, vibrant people and how, in turn, the concept of home has been central to the life and culture of the city. Admission to both the symposium and the block party is free, and registration is not required.